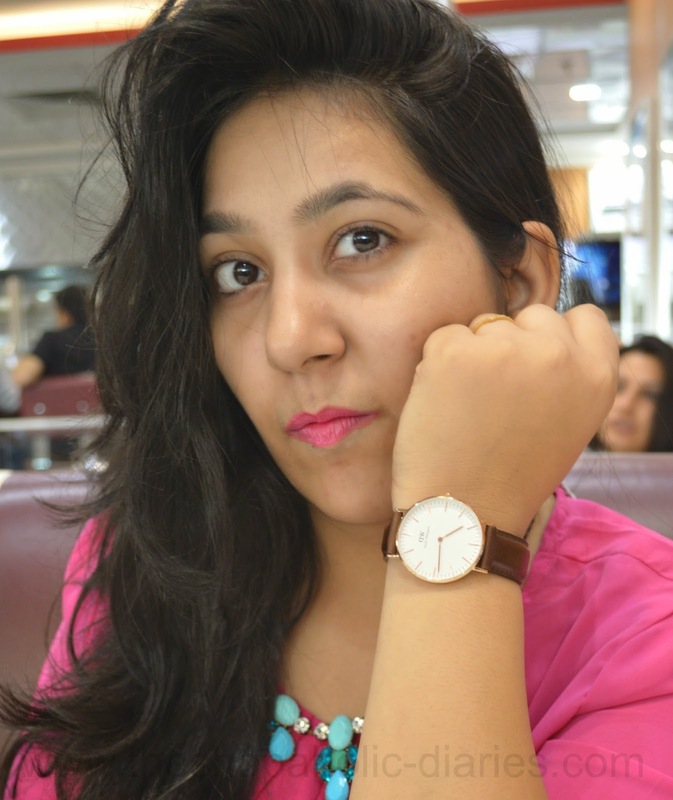 OOTD - Watch It Out - Daniel Wellington Classic Bristol Lady | The Shopaholic Diaries - Indian Fashion, Shopping and Lifestyle Blog ! Hope you all are enjoying the change in the weather and the lovely feel of Fall finally setting in. Even I think it's time to re-arrange my wardrobe and make space for my autumn-winter clothing. Last week I got my hands on my first Daniel Wellington watch - a Classic Bristol Lady - and I thought it was perfect to style for my first autumn outfit post with its laidback design. 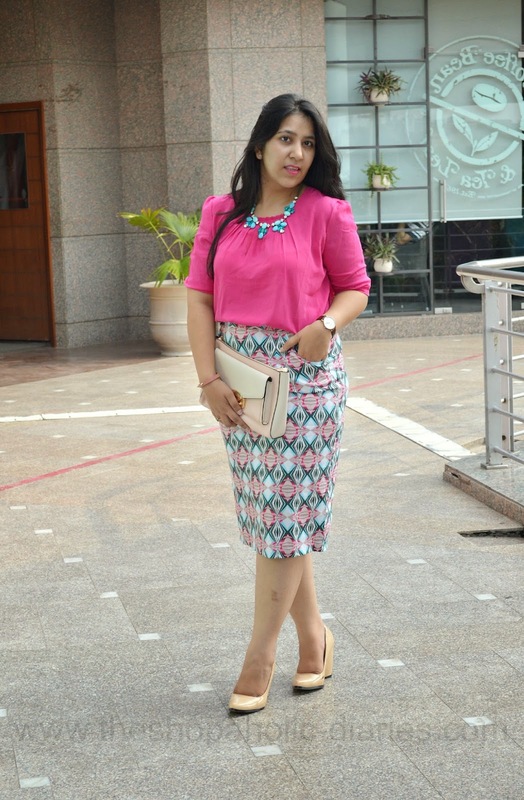 As the weather has slowly turned cool, I decided to wear my new printed pencil skirt from Precious Melove with a bright pink top from US Polo. 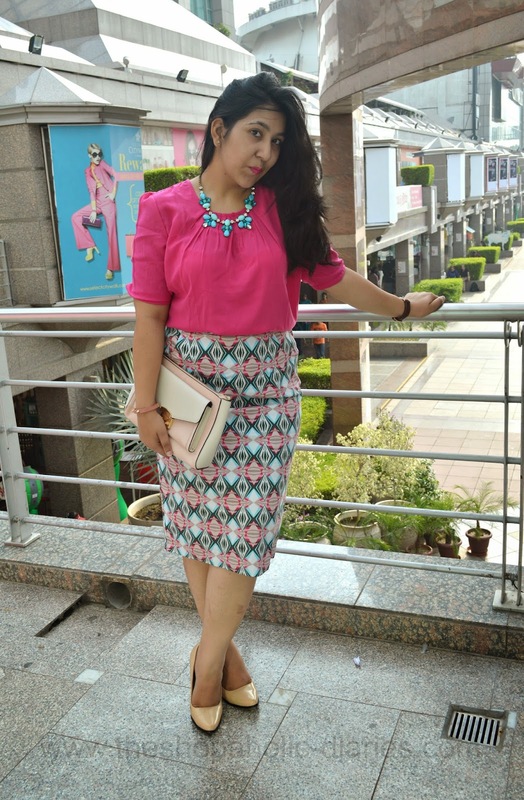 I accessorized the look with a blue statement neckpiece from Accessorize, a classy clutch bag from Accessorize and a pair of beige block heels from Forever 21. 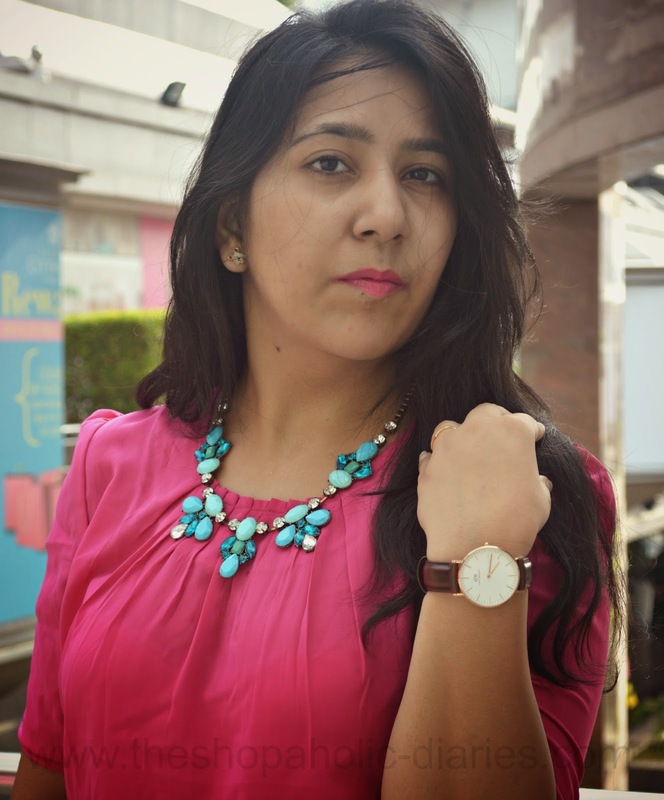 And to give an elegant vibe to the look, I paired my DW which has a minimalistic dial and a perfectly dark brown band that added a touch of luxury to the otherwise fun and chic outfit. The beauty of this DW watch is that it comes with interchangeable straps that helps me match the classic dial to my everyday mood and style. 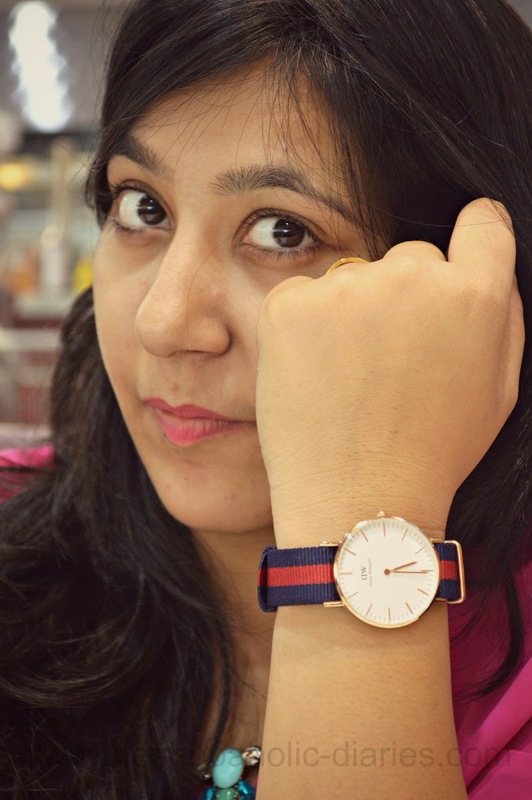 I paired the dial with the trendy Classic Oxfort wristband which has a striped pattern that looks perfect with any casual or semi-formal attire. Looking at the classy style and amazing finish of this watch, I am tempted to buy one in a silver dial as well to add versatility to my accessories wardrobe. PS : Did you like my DW watch and wish to own this too? Keep looking at this space as I will announce an exclusive International Giveaway in the next post which will give all my lovely readers a chance to win their favorite DW watch. I love your outfit. 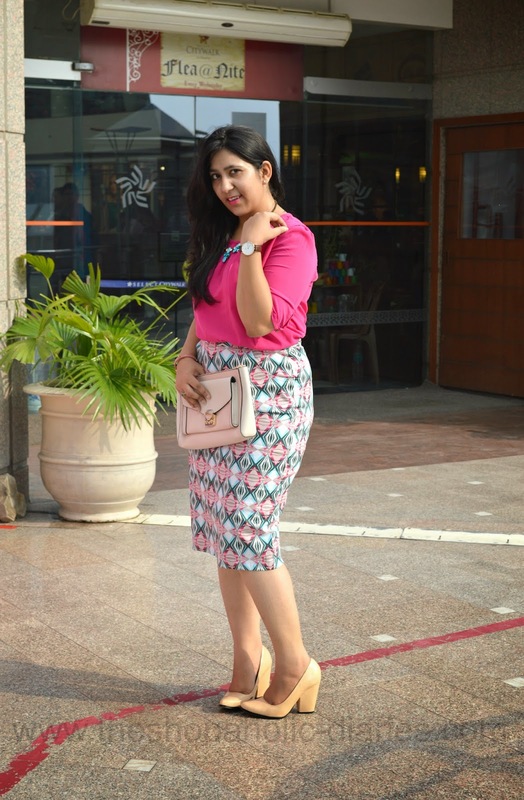 Bright, girly and colorful. And watch is an added bonus. You look lovely girl... chic!! Loved the outfit..that skirt is super!